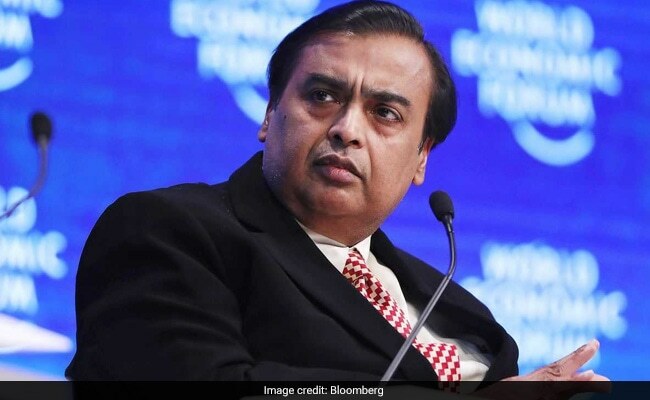 The chairman of Reliance Industries Ltd. has added $12.1 billion (around Rs 77,000 crore) to his wealth this year, according to the Bloomberg Billionaires Index, as shares of his refining-to-telecom company surged to a record. 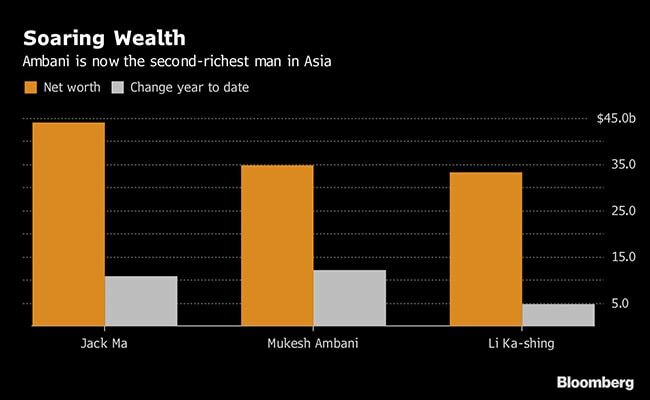 Mukesh Ambani has elbowed past Li Ka-shing to become Asia's second-richest man as investors rallied behind his efforts to arm India's poor with cheap data-loaded phones. Some analysts are beginning to focus on the costs of his ambition. The chairman of Reliance Industries Ltd. has added $12.1 billion (around Rs 77,000 crore) to his wealth this year, according to the Bloomberg Billionaires Index, as shares of his refining-to-telecom company surged to a record. Spurring the rally on is optimism that a new $23 phone (Rs 1,500) launched last month will expand the market for Ambani's fourth-generation mobile network into India's hinterland. The whistles and applause that greeted the JioPhone obscured the fact that by one measure the company's debt has climbed to at least a 15-year high. The telecom business, Ambani's seven-year labor of love, has sucked in more than $31 billion (around Rs 2 lakh crore) in investments and is yet to earn him and his shareholders any profits. It's contributed to a near tripling of the group's total debt since March 2012 and sparked a vicious price war in the world's second-largest mobile-phone market. About 90 percent of Reliance's revenues continue to come from its legacy refining and petrochemicals units, with retail, media and energy exploration contributing the rest. Local brokerage Kotak Securities Ltd. sounded a warning on July 23 when it downgraded Reliance's stock to reduce. "We remain wary of high capex run-rate and rising net debt levels," wrote Mumbai-based analysts Tarun Lakhotia and Akshay Bhor. 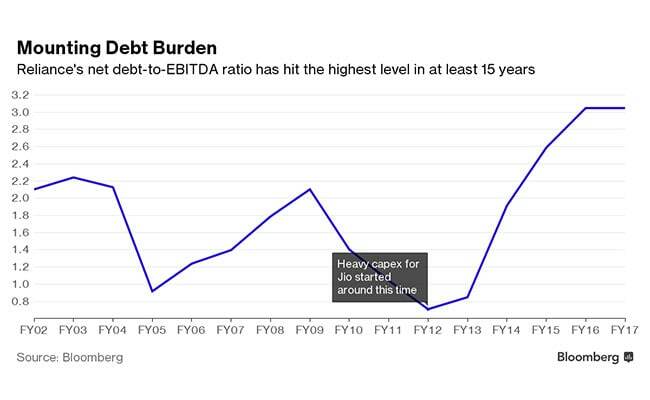 The company's net debt-to-EBITDA ratio has quadrupled in the five years to March 2017 and is at the highest level since 2002, when Bloomberg began tracking the data. Analysts consider EBITDA a gauge of a company's operating profit, or the money it makes before paying taxes, interest on loans and accounting for depreciation and amortization. A Reliance spokesman didn't respond to an email seeking comment about the company's growing debt. Ambani described Jio as "a jewel" among Reliance assets during the company's annual general meeting on July 21. "Its business and societal value will grow immensely over the next decade," he said. "Jio will become India's largest provider of data service, products and application platforms." To be sure, Kotak Securities is among a minority of four brokerages with a sell rating on Reliance, compared with 13 hold and 21 buy recommendations among firms Bloomberg tracks. The company's shares have climbed 49 percent this year to close at Rs 1,615.20 in Mumbai on Monday, compared with a 12-month target of Rs 1,619.20. IDBI Capital Market Services cut its recommendation to 'accumulate' from 'buy' last month citing the recent share surge, while Macquarie Research re-initiated coverage of Reliance with an 'underperform' call. Since carrier Reliance Jio Infocomm Ltd. is a new business, it will have to account for "significant" depreciation and amortization charges, which will result in losses till the year ending March 2021, Macquarie Research analyst Aditya Suresh wrote in a July 25 report. Depreciation and amortization allow a company to spread out an asset's cost over its life. To justify its share price "in addition to the growth from RIL's new refining and petchem projects and a constructive refining margin view, we need to ascribe $12 billion option value for Jio," Suresh wrote. "With not a single dollar of revenue booked we consider this optionality premature." For Ambani, the gains have swelled his net worth to $34.8 billion (around Rs 2.2 lakh crore), taking him to number 19 in the Bloomberg Billionaires Index from 29 at the end of 2016. He passed Li Ka-shing -- whose empire spans telecommunications, retail and ports -- for a few days in April and again on July 7. Jio took just nine months after launching with a free introductory offer to rope in 117.3 million users and become India's fourth-largest operator, according to government data compiled by Bloomberg. Optimism about the telecom upstart's prospects grew after Ambani announced initial pricing for the service in February, sparking an almost 50 percent surge in Reliance shares. The 4G JioPhone unveiled last month further fueled the rally. The handset will run on voice commands in 22 Indian languages and the company expects its cheaper rates and high-speed data access to open up a market of about 500 million customers currently using feature phones on second-generation networks. Investments in refining and petrochemicals may start benefiting Reliance from the current financial year, said Vishal Kulkarni, a Singapore-based analyst at S&P Global Ratings. He expects operating profits from these businesses to grow by 50 percent in the year ending March 2019. Jio may make an operating profit of $1 billion (around Rs 6,400 crore) this fiscal and triple it next year, he said. 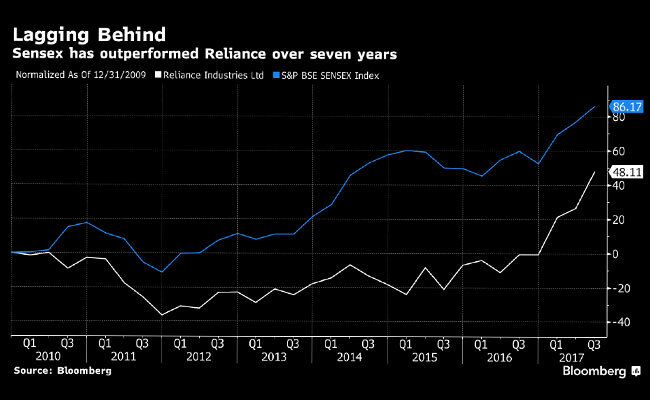 S&P has a BBB+ rating on Reliance with a stable outlook, two notches above the sovereign's BBB- rating, implying it can raise money at very competitive rates. Still, Kulkarni expects the telecom business to be at least two years from having a mature, paying subscriber base. "There are strong incumbents, which will give a good fight over subscribers or revenue share," he said. "More than 70-80 percent of the EBITDA will come from refining and petrochemicals." 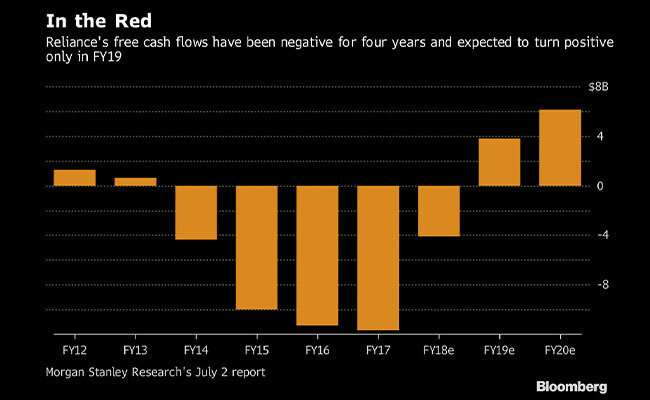 Despite healthy additions from refining and petrochemicals, cash reserves have declined 7 percent in the past five years, according to statements on Reliance's website. The reduced reserves are a tad inconvenient as the company has almost $12 billion (around Rs 77,000 crore) of debt coming due in the next three years. Any repayment or refinancing will depend on the cash-churning legacy businesses, which helped the group pull in a net profit of about $4.7 billion in the last financial year. "Our energy and materials businesses constitute a strong platform to generate stable, annuity-like cash flows with a potential to reach EBITDA of Rs 1 trillion (Rs 1 lakh crore) within the next few years," Ambani said on July 21. Free cash flows, a gauge of a company's financial performance and ability to repay debt, are expected to move back into positive territory in the financial year ending March 2019, according to a July 2 Morgan Stanley report. The measure turned negative in the year ended March 2014 and deteriorated further over the next three years. Reliance's reported debt numbers may actually increase over the next two to three years due to planned investments of about Rs 55,000 crore in the current fiscal and a "significant payment" due for capital spending and deferred liabilities, according to Kotak Securities. 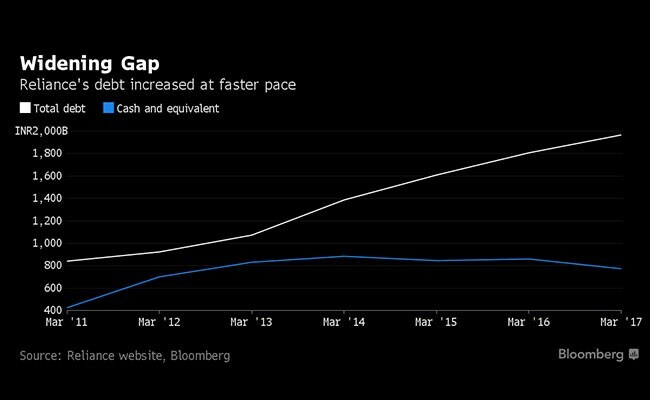 "We rule out a substantial reduction in effective net debt over next 2-3 years," the analysts wrote, noting the "continued cash burn in Jio."